Congratulations to this year's University of Arizona College of Pharmacy Preceptor of the Year and Rookie Preceptor of the Year! Boesen Family Preceptor of the Year is Amber Pate with Wal-Mart Neighborhood Market in Tucson, Ariz. The Arizona Delegates to the American Society of Health-System Pharmacists are Mindy (Throm) Burnworth, Carol Rollins, Christi Jen and Mitch Buckley (alternate). We are contacting you to ask for your feedback on the proposed policies and recommendations that ASHP will be voting on this June at the ASHP Summer Meeting. Please forward along your comments or suggestions by Wednesday, April 19 at 12 noon. Go to the website to view the document. Please forward your comments or suggestions. 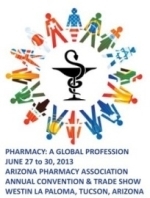 Watch your mailbox for complete information about the 2013 Arizona Pharmacy Association Annual Convention & Trade Show, June 27-30 at the Westin La Paloma in Tucson, Ariz. Controlled substance diversion is a major challenge for hospitals across the country. The problem is being fueled, in part, by the power of addiction: It is estimated that 10 to 15 percent of health professionals will develop serious substance abuse/addiction problems during their career. Experts warned during a recent webinar that vigilance by all hospital staff — those in pharmacy, nursing, security, human resources and administration — is required to address this looming problem. When the latest version of what is considered the "bible" of psychiatry is unveiled in May, experts believe several changes in it will broaden both the definition and diagnosis of attention-deficit/hyperactivity disorder — or ADHD. But experts also differ on whether the shifts in thinking about this neurodevelopmental disorder will be a good thing. Looking for similar articles? Search here, keyword NEURODEVELOPMENTAL DISORDERS. With so much confusing and even misleading information about vaccine safety available on the Internet, it's no surprise that parents are influenced by their friends' attitudes when it comes to immunizing their kids. Researchers who surveyed 196 parents of children 18 months or younger in areas in Washington, Vermont, Wisconsin and Minnesota found at least 95 percent of parents in two groups indicated that they had consulted their "people network" for insight into making vaccination decisions. Pharmacists can more easily help make improvements in their healthcare settings by working in multidisciplinary teams, according to a session on safety and quality pearls presented at the American Society of Health-System Pharmacists 2012 Midyear Clinical Meeting. "We [as pharmacists] sometimes have tunnel vision," said Lt. Col. Jorge Carrillo, the deputy director of the Military Vaccine Agency, in Falls Church, Va., who organized the pearls session. It's important to work in multidisciplinary teams and consider several strategies to solve a problem, he told Pharmacy Practice News. In an effort to enhance the overall content of Pharmacy Flash, we'd like to include peer-written articles in future editions. As a member of the pharmaceutical industry, your knowledge lends itself to unprecedented expertise. And we're hoping you'll share this expertise with your peers through well-written commentary. Because of the digital format, there's no word or graphical limit and our group of talented editors can help with final edits. If you're interested in participating, please contact Ronnie Richard to discuss logistics. The FDA is stepping up pressure on firms that make drugs for specific individuals, known as compounding pharmacies, as it seeks greater regulatory authority following a deadly meningitis outbreak traced to one such pharmacy. Doctors in the United States routinely prescribe potentially harmful drugs to older patients, and the problem is particularly acute in the South, a new study shows. The analysis found that more than 1 in 5 seniors on Medicare in the South were prescribed medications that health authorities have specifically advised doctors to avoid giving to older patients because of their severe side effects. Paul Offit, from the Vaccine Education Center at the Children's Hospital of Philadelphia, discusses an article that was recently published in the Journal of Pediatrics by Frank DeStefano and co-workers from the Centers for Disease Control and Prevention, looking at the relationship between vaccines and autism. The bankruptcy estate of the pharmacy linked to a deadly U.S. meningitis outbreak plans to battle nearly 30 states to preserve its right to redeem several million dollars worth of insurance policies for creditors. The insurance policies are key assets in New England Compounding Center's bankruptcy estate. Without mentioning the word recall, the FDA recently posted a notice advising pharmacies and other customers of Shamrock Medical Solutions Group LLC to take action to ensure drug products from that company are not administered to patients. The agency said these products "may be mislabeled." Diclegis has been approved by the FDA to treat nausea and vomiting associated with "morning sickness" during pregnancy. The drug was sanctioned for pregnant women who haven't responded to other therapies, such as eating smaller meals, eating lower-fat foods and avoiding smells that can prompt nausea, the agency said in a media release. The Centers for Disease Control and Prevention has published its 2013 immunization schedules based on recommendations from the Advisory Committee on Immunization Practices. The schedules include several significant changes, including the recommendation that high-risk adults receive the 13-valent pneumococcal conjugate vaccine.